Glen Smale combines the lure of the open road, the enduring magic of Le Mans and a very busy week. 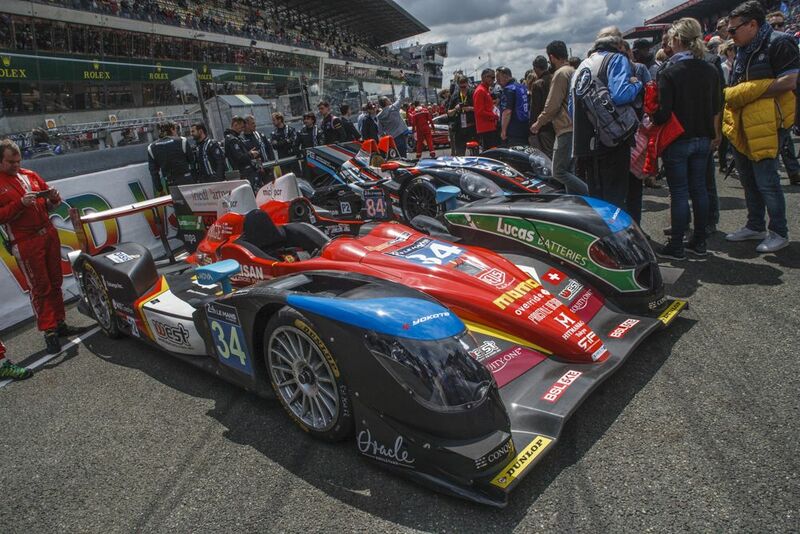 Once a year, around mid-June, we embark on an annual trip to the Le Mans 24-Hour race. The city of Le Mans, renowned for its rich cultural heritage and historic buildings, is located in the Pays de la Loire region on the Sarthe River. This regular adventure to the 24-Hour race is the highlight of our motorsport year, and is the busiest time of the year work-wise. 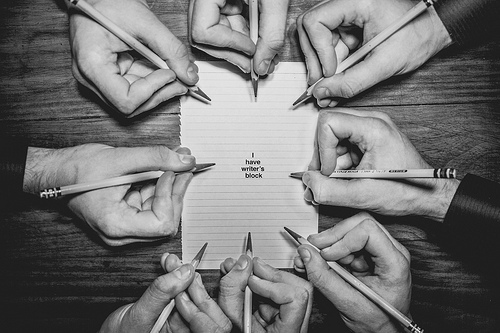 The winning No. 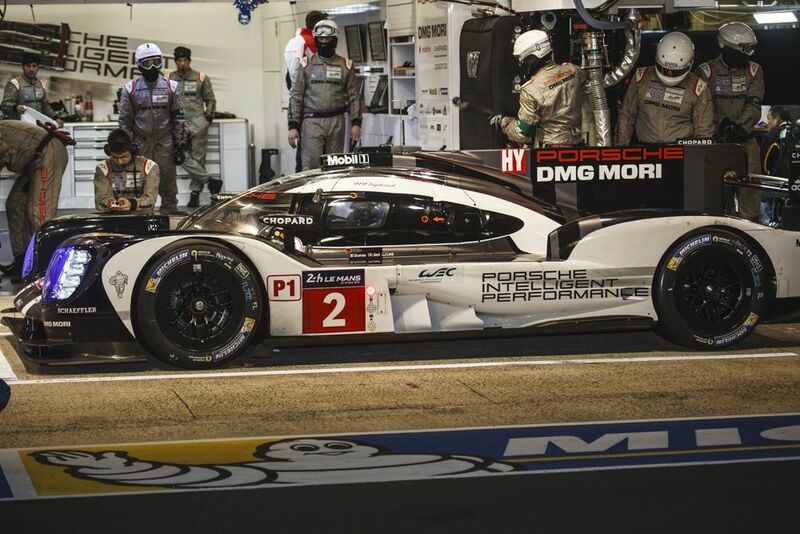 2 Porsche 919 Hybrid in the pits during practice. Having grown up in far-off South Africa, the race at Le Mans was always my most favourite motor race in the year, but with next to no coverage in South Africa, I had to rely on the ‘overseas’ magazines for any news. Immigrating to the UK in ’99, I made it my goal as a motorsport journalist to take in as many of these races as possible, and the 84th running of this legendary race in 2016 marked my eighth visit to Le Mans. With an estimated 100,000 UK spectators a year travelling to this legendary race, it is reasonable to say that the Le Mans 24-Hours is Britain’s biggest annual race that takes place in France. 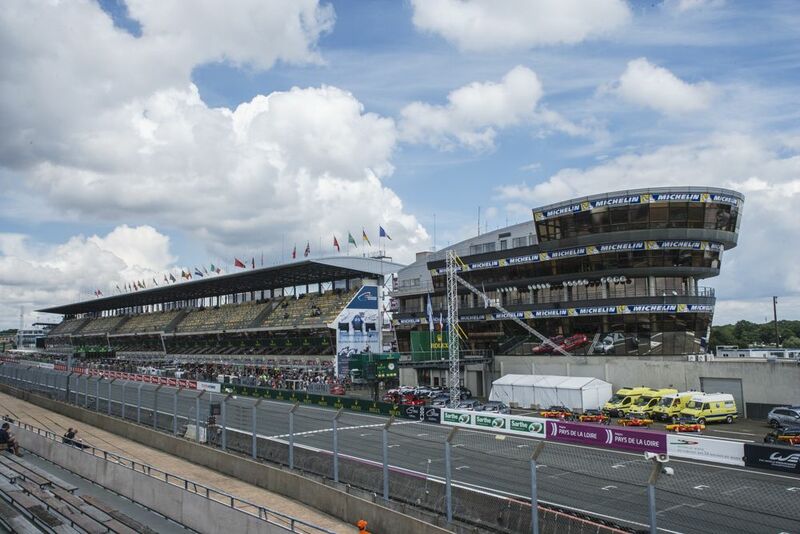 Le Mans Race Control and main grandstand on start/finish straight. 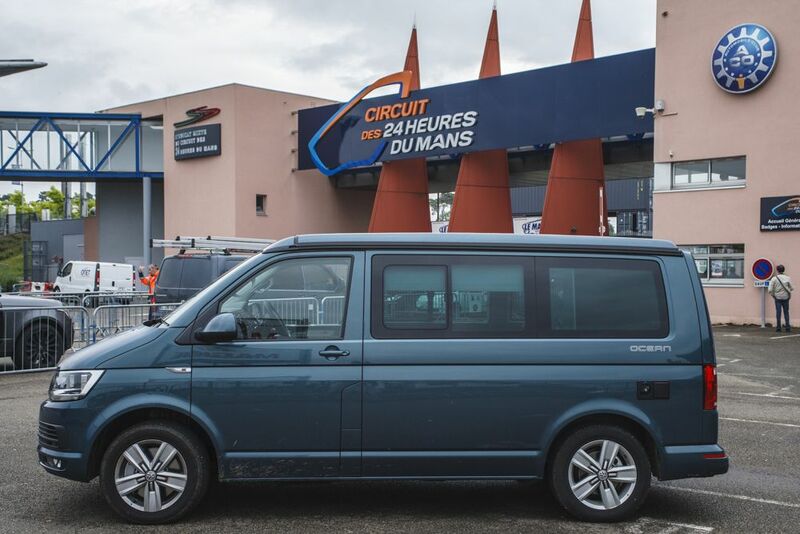 Twice before we have camped with a tent, twice we have driven over in a VW California, on three occasions I have been on my own where I have slept in a vehicle (like many others), and once I stayed miles from the circuit and I had to get a lift to the circuit each morning. In summary, you could say that I have done it all, but the best by far have been the two stays in a VW California, one of which was this year. The adventure started on Friday 10 June, when a gleaming ‘Bamboo Garden Green’ California was delivered to my house at 09h00, bright and early, giving me ample time to pack all the goodies necessary for the 10-day trip to France. The first phase of the journey down to Sandhurst was a relatively simple one as the roads are familiar and I used the California’s on-board satnav to keep me informed as to my expected arrival time. As I approached Sandhurst, the mother of all storms broke and progress was reduced to a crawl. My wipers were on double speed and my headlights and fog lights were on to ensure I could be seen in the blinding spray. But as quickly as it started, the storm was over. By overnighting with a fellow journalist and his wife, this left me just an hour or so of travelling to do on the Saturday morning. down to the ferry port at Portsmouth. Waiting in the queue at Porstmouth with the many football fans who travelled to Europe. Come the daylight and I was up with the sparrows and set course for Portsmouth, with the aim of arriving in good time for the 08h15 sailing. What I had not thought of was, that this was also a favourite departure point for all those football fans wanting to attend the Euro 2016 matches! This meant that I had my vehicle and one of my bags searched by the customs folk, which I guess was to be expected. Over the years, I have found the Brittany Ferries crossing to be the most suitable for me, leaving Portsmouth at 08h15 and arriving at Ouistreham at 15h15 (local time), just 15km north of Caen. It is great to have a cabin both for sleeping (especially on my return trip) and to have some time to work undisturbed. So the six-hour trip across to France was put to good use as I read up as much as possible about the various cars, teams and drivers participating at this year’s Le Mans race, and I made notes on what I needed to do once I arrived at the circuit. So, disembarking in Ouistreham, I set course for the little village of Brûlon in the region of Pays-de-la-Loire, taking care to avoid motorways and toll roads. The best way to see a country is not to zoom past all the best bits on the motorway, but to take the scenic route. This road south took me through some beautiful farming communities, picturesque villages, and through the magnificent National Forest of Pail. Speeds were quite slow through this region, between 70 and 90 km/h, but that allowed me to take in the surrounding scenery. Stopped along the road through the magnificent National Forest of Pail. Finally, I reached the village of Brûlon, but trying to find a signpost for the campsite ‘Le Septentrion’ required some significant navigation skills and a pair of very good eyes. After passing right through the village to the other side, it was only on my return run that I spotted a small sign to the campsite down a narrow bumpy road. At just €13 per day, these rural camp sites are both very reasonable and clean. This was going to be the most peaceful and quiet night’s sleep during my whole Le Mans trip. Once I was settled in at Le Mans, it was going to get very noisy. 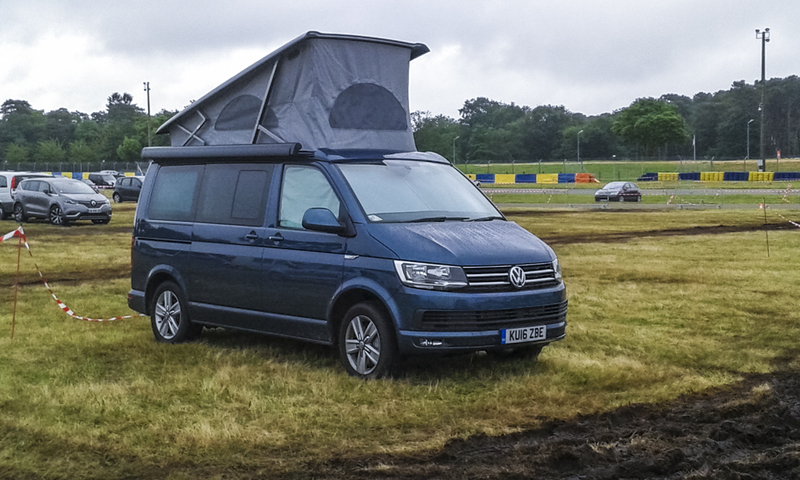 The VW settled in for the night in a camping site on the outskirts of Brûlon village. Early on Sunday morning I headed out of the camp, down some more very narrow country lanes and through the sleepy villages of Mareil-en-Champagne, Chassillé, Longes and Coulons-sur-Gée before I hit the D357 into Le Mans, arriving at the media sign-on at 09h00 sharp. By now the California was looking somewhat grubby and travel stained, but the vehicle had behaved impeccably, and I felt well rested. After signing on, and with my media accreditation in hand, I headed to my parking spot and then made my way to the circuit press centre lugging a heavy camera bag, laptop bag with loads of battery chargers and extensions, plus other equipment, across the paddock and up two flights of stairs. It’s all part of being at Le Mans, but at least I had arrived. The California rests in a parking lot at Le Mans. That afternoon I left the circuit and headed for the old town where, together with two other colleagues, we watched and photographed the scrutineering procession. 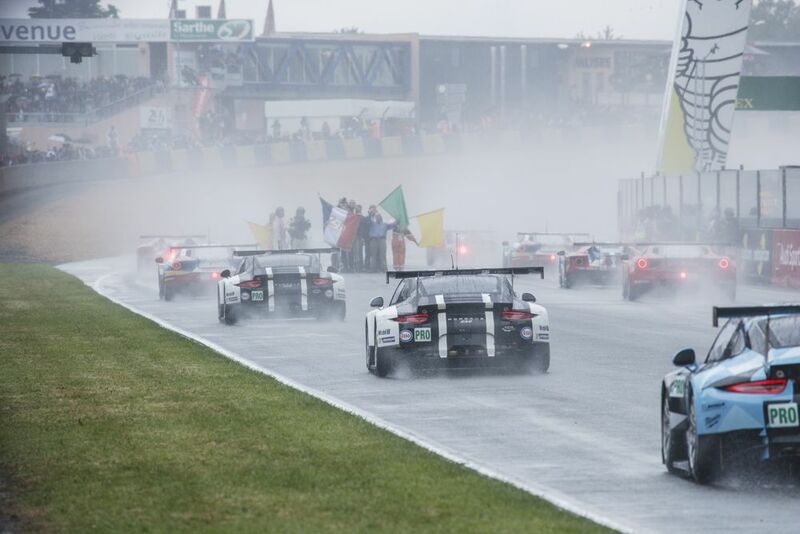 One thing that characterised the whole week at Le Mans this year, was that each day was punctuated throughout the day with heavy downpours, followed by brilliant sunshine. This of course resulted in high humidity which caused condensation inside camera lenses, so it wasn’t all fun. 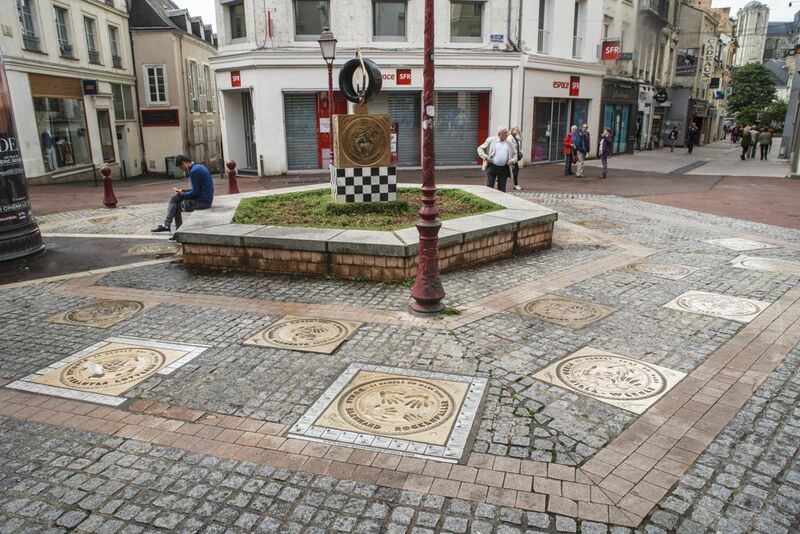 Plaques with winning driver handprints in Le Mans town. Back at the circuit that night I raised the roof of the California, stretched out my sleeping bag, and after a welcome shower in the excellent paddock facilities, I was out like a light. Monday and Tuesday were spent writing, interviewing drivers, meeting the teams, and photographing drivers and cars in the pit lane. On Wednesday the first Free Practice session (FP1) got underway at 16h00 and ran for four hours, then from 22h00 to 24h00 was the first night Qualifying (Q1) session. During this time, I split my attention between doing trackside and pit lane photography. Following this late session, one can easily spend two hours downloading photos onto the laptop and writing up your thoughts and observations from the day’s activities. Thursday was in some ways a repeat of Wednesday except that both sessions now counted towards official qualifying for final grid positions. So Thursday’s Q2 and Q3 sessions were very important. Q2 went off alright, the end of the session being hit by one of those downpours again, but 30 minutes into the start of Q3 the heavens opened and the two-hour session was red-flagged. So heavy was the rain that the safety car almost spun off the circuit at one point. Porsche had secured pole position for the start with a time they had set in the dry period during Q1 on Wednesday. 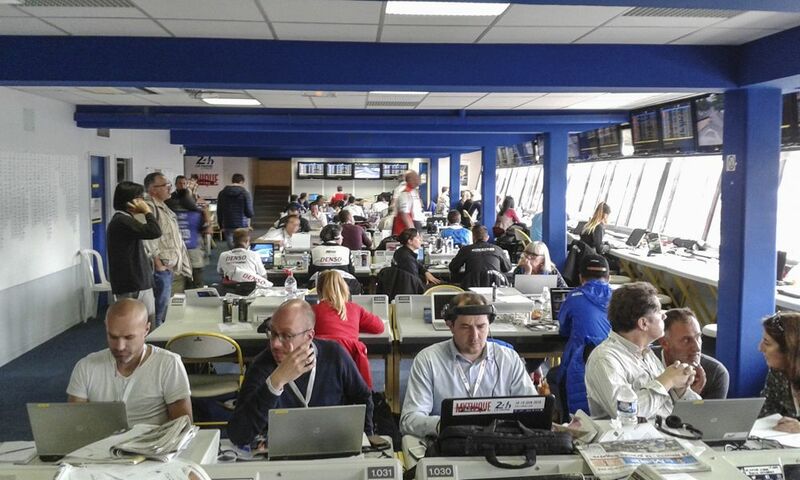 Media centre which caters for around 700 journalists/photographers on race weekend. On both Wednesday and Thursday night we finished up in the media centre at around 02h00, and so at that stage the California was a very welcome sight. At no stage did the rain pose a problem for the California despite leaving the roof raised all day while I was away working around the circuit. 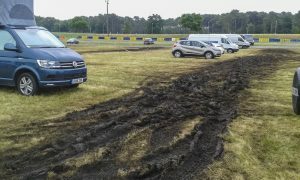 Fortunately, I had arrived early enough because, those who arrived later, created an almighty mess of the access lanes in the car park, turning them into mud baths. Leaving the pull down blinds halfway down all around the vehicle ensured that the interior stayed cool all day, and with the refrigerator left running on the leisure battery, food stayed cold enough to survive. …some drivers churned up the parking lot during heavy rains. All the rain that we had during that week resulted in me coming back to the California each night with muddy boots, so I would not recommend buying one of these vehicles with light-coloured carpets. At the end of the week, the carpets were definitely not the same colour as on the day the vehicle was delivered to me. 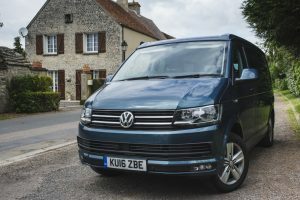 One has to think about where the vehicle will be put to use, and being aimed at outdoor activities, it will almost always have dirty shoes or feet clambering aboard, and so a more serviceable carpet colour should be considered. Aston Martin GTE PRO drivers (from r-l) Darren Turner, Niki Thiim, Marco Sorenson. The pit lane is open to the public on Friday afternoon. Traditionally, Friday sees no action on the track, as the teams spend this time preparing their cars for the big day on Saturday. 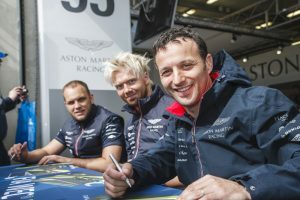 It is also customary for the fans to be given free access to the pit lane where they can get their favourite drivers to sign hero cards and posters. For this purpose, the teams erect tables in front of their pits for the drivers to sit at and to sign these items of memorabilia. And, you guessed it, it poured with rain. As a photographer, in an effort to keep out of the rain, I made my way under ropes, ducking refuelling equipment and taking short cuts through most of the garages in order to get photos of as many drivers as possible for my various scribblings. Friday night is not a work night as the media centre closes early ahead of the very long and tiring weekend, so after a good dinner, an early night was in order, in preparation for the marathon to follow. 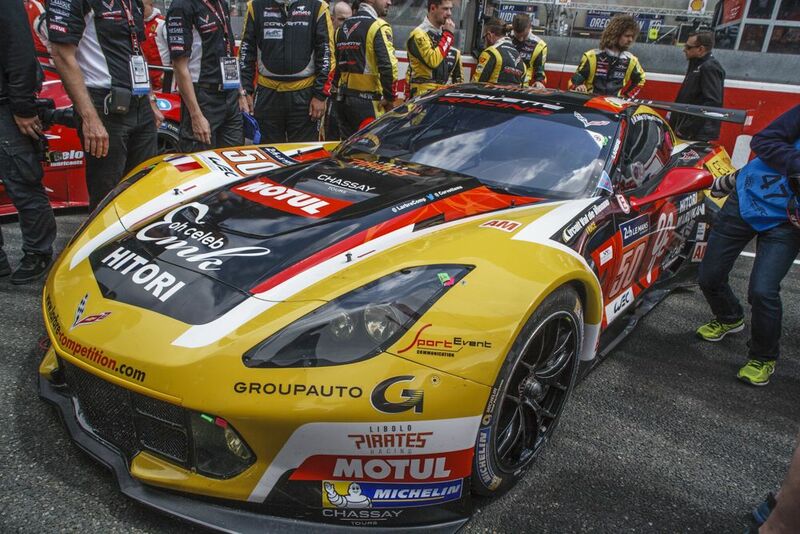 The GTE AM Chevrolet Corvette C7.R on the starting grid. Saturday morning dawned bright and clear, and most folk agreed that there would be rain at some point, but no-one really knew exactly when. The morning saw two curtain-raiser races, the Ferrari Challenge and the Road to Le Mans events, before the circuit was closed ahead of the main event. The 24-hour race started at 15h00, but in order to get good shots of the cars, drivers and team personnel on the grid, one had to head down to the track at about 11h45. I allowed myself about an hour to get the photographs I needed, then shot back up to the media centre to get my long telephoto lens and rain gear, because the clouds were gathering already, despite the bright and humid conditions. Around this time there were the usual national hymns, helicopter drops of armed personnel and flypast by the French airforce, and of course the walk-about by the VIPs and various celebs. No. 34 LMP2 Oreca 03R-Judd and No. 84 Morgan LM P2-Nissan experimental car. Armed with my long lens and rain gear, I made my way over to the other side of the track so that I could secure the position I had decided would be best for the start. At some time after 14h00, the cars headed off on the first formation lap which allows them to settle in and if necessary, to call into the pits for some minor tweaks, before taking up their grid positions according to their qualifying times. Then came the rain, and one could only feel sorry for the gorgeous and brave grid girls who were dressed in attractive short dresses, as they were soon shivering in the heavy rain. 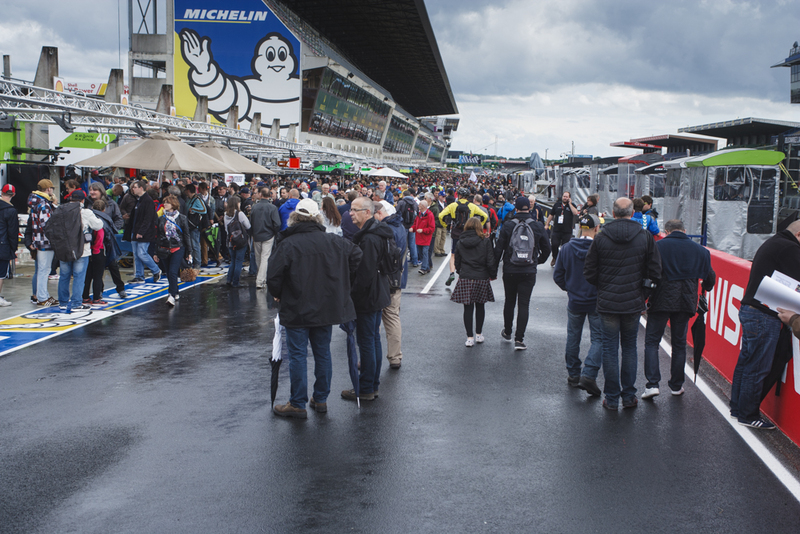 The team personnel did their best to shield the girls from the brunt of the weather, and at around 14h45 they vacated the grid, along with all VIPs and celebs. An announcement over the Tannoy gave an update on the weather, which was that we could expect rain for the next two hours after which it would clear and stay that way for the next 24 hours. There followed a mad scramble as team members raced back to their pit garages to get the correct tyres for the conditions that had just been forecast. At five minutes to three, the cars all set off behind the safety car, and this procession continued to circulate for the next fifty-plus minutes, much to the annoyance of the crowd who had paid to see racing, not Sunday afternoon driving. But when the safety car pulled into the pits, the race was really on and we were treated to a further 23 hours of fantastic nose-to-tail racing in all four classes. Not for many years, has the lead at the front of the pack changed so often and remained so close for the entire race as it did this year. For a more detailed account of the race itself, visit our blog Le Mans rollercoaster and Final Hours of Le Mans 24H 2016. Cars being waved off by actor Brad Pitt at the start. Following the end of the race, there were the customary podium celebrations and press conferences, and then it was back to the grindstone in the media centre as you try to scribble down all your recollections and thoughts from the previous 24 hours. Downloading your images and recording your thoughts can take several hours, after which you seek out those you need to say farewell to, because it will be twelve months before you see some of them again. After so many late nights and having walked endless miles (next year I am going to wear a pedometer) with heavy camera gear, and then having stayed up all of Saturday night, you are completely exhausted. But then there was the small matter of packing up your gear from a week’s worth of work, gathering reports and press releases from the race, and heading for your vehicle… to be faced with a drive of several hours back to the ferry port. My ferry was only booked for 08h00 on Monday morning, so I was under slightly less pressure. So I set a course for Ouistreham, being eager to find one of those convenient overnight parking bays for caravans and motorhomes on my way. As it happened, I could not find one, and so I drove all the way to the ferry port and parked in the queue of motorhomes already there, waiting for the next morning’s sailing. Within minutes, I had the roof up and my sleeping bag rolled out, and I settled down for a good six to seven hours of much-needed sleep, being sure to set my alarm for an early wake up as I had an appointment with the port duty manager the next morning. Prior to my departure from Wales, I had arranged through Brittany Ferries to be allowed to take some photos of the California on the quay side in front of the vessel, for purposes of this feature. “Oh sure,” they said, “we are used to Mr Smale taking photos in front of the vessel,” so I must have been doing something right! 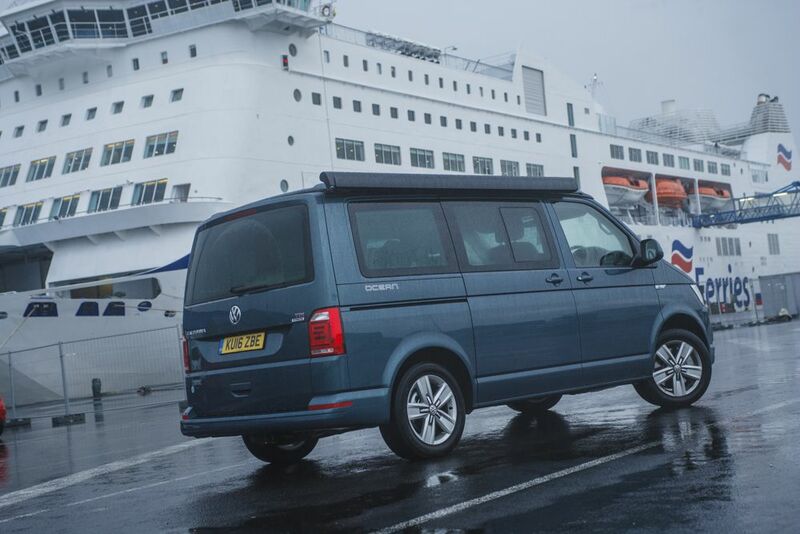 Normally it is bright and sunny on the French side and raining in Portsmouth, so photographing the vehicle in Ouistreham is usually the way to go, but this time not so, as it was still raining. 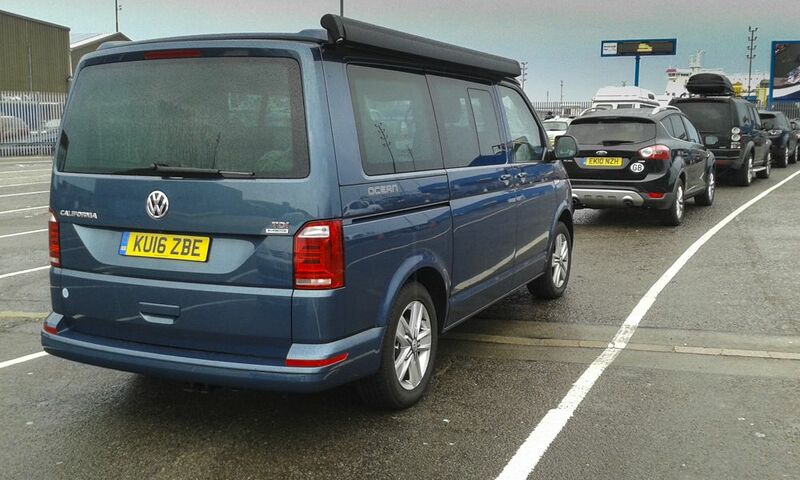 So a few hurried and wet photos later, I was back in the California and driving it up the ramp onto the ferry. It was raining for our departure from the Caen ferry port. The best laid plans of men and mice… is apparently how the idiom begins, because I made my way to my cabin armed with a change of clothes and my laptop intending to put in a few hours of work during the crossing. After some breakfast and a shower, I thought it would be a good idea to just take a short rest… but the next thing that I heard was a blast on the ship’s Tannoy announcing that we were just about to dock in Portsmouth, and would all passengers please vacate their cabins!! Six hours had disappeared I know not where. So I gathered my goodies together and headed for the car deck with some urgency. Back in Blighty, I was faced with a five to six-hour journey back to West Wales depending on traffic conditions, but a simple enough journey. My regular route home to Wales from anywhere on the eastern side of the country, whether it is from Heathrow, Silverstone or Goodwood, is to use the M4 up to J15 at Swindon, where I exit the motorway and follow the A419 and A40 towards Monmouth, Abergavenny and Llandovery. There are several reasons for this, the first being that this route avoids the Severn crossing where one is relieved of £6.50 for the privilege of entering Wales. This toll has been increased annually from around £3.00 not so long ago. And I would rather travel a longer route than pay this ridiculous amount, and if you are unlucky enough to time your crossing at rush hour, you can sit in the Severn toll queue for an hour. The second reason is that the A419/A40 route is much prettier and one can look at some beautiful scenery instead of a boring and straight piece of motorway. Thirdly, I feel that I have reached Wales sooner by travelling through the beautiful Brecon Beacons, whereas along the other route, the motorway reaches as far as Carmarthen which leaves one feeling that you are still in a built-up metropolis. 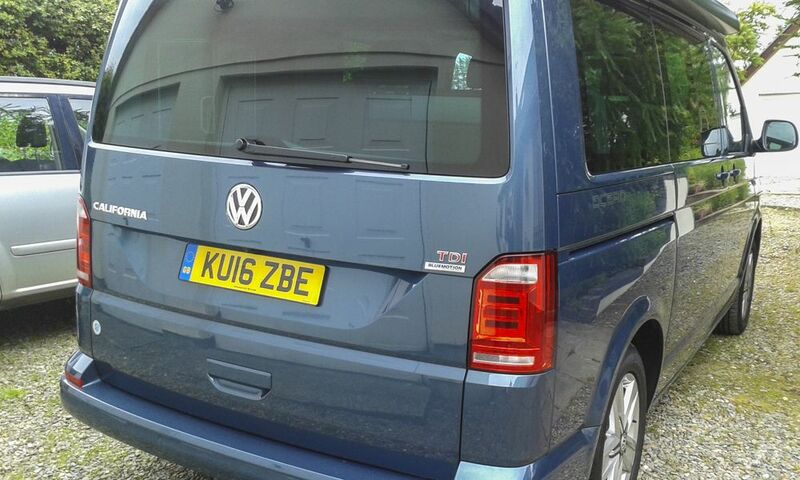 VW California back home again in Wales. With my 10-day journey nearing an end, I could reflect on the time I had spent with the California. 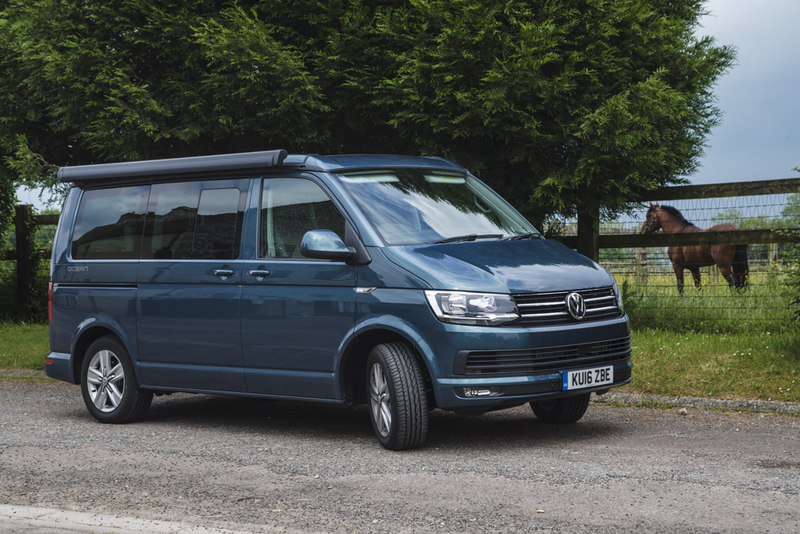 Firstly, VW has built on its 60-year camper van heritage, creating a vehicle which still oozes character and gives one the sense of freedom and exhilaration behind the wheel. 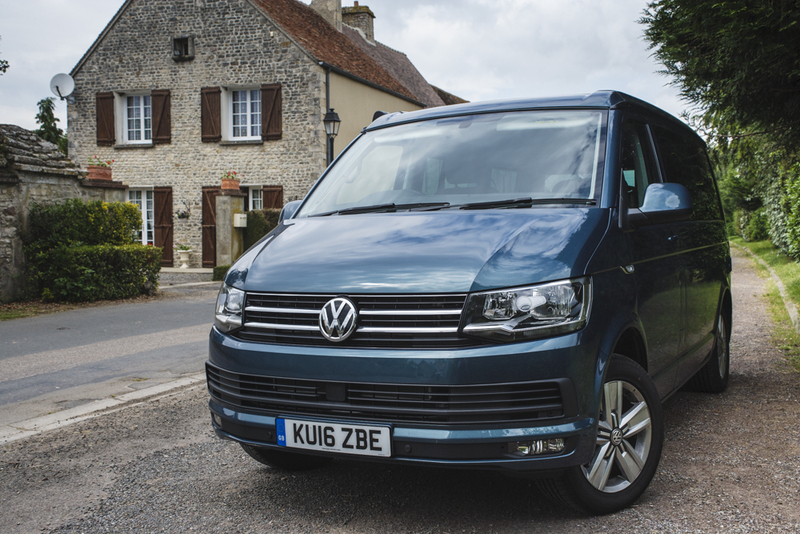 Sure it has got all the mod cons on-board, and it costs a whole lot more than the old camper van did back in the 1960s, but then the market has moved on and now demands far more sophistication in a vehicle. The California offers comfortable sleeping for four adults. 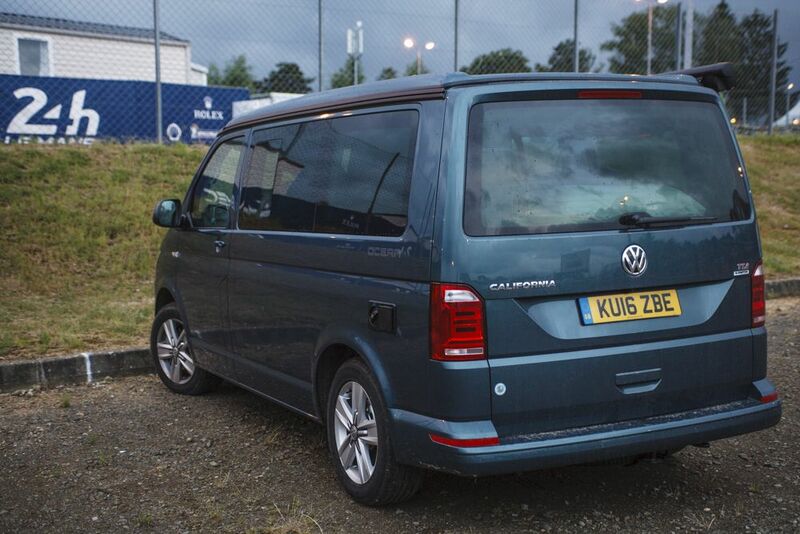 Or if it just a day out, five adults can sit in comfort and safety thanks to the wide rear bench seat. 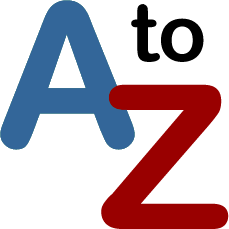 Cooking and washing up is a simple matter of firing up the twin plate gas cooker, or simply turning on the tap in the basin with water being fed from the 30-litre tank via an electric pump. A really novel idea is the inclusion of a foot shower which can be connected to the vehicle’s water supply. The shower head unit is found in the rear of the vehicle, and is there to clean off dirty feet or boots, prior to entering the vehicle, after a busy day at the beach or hiking in the hills. The test model, called the Ocean, comes with a press button electric motor to lift the roof, whereas in the Beach model this is manually operated. 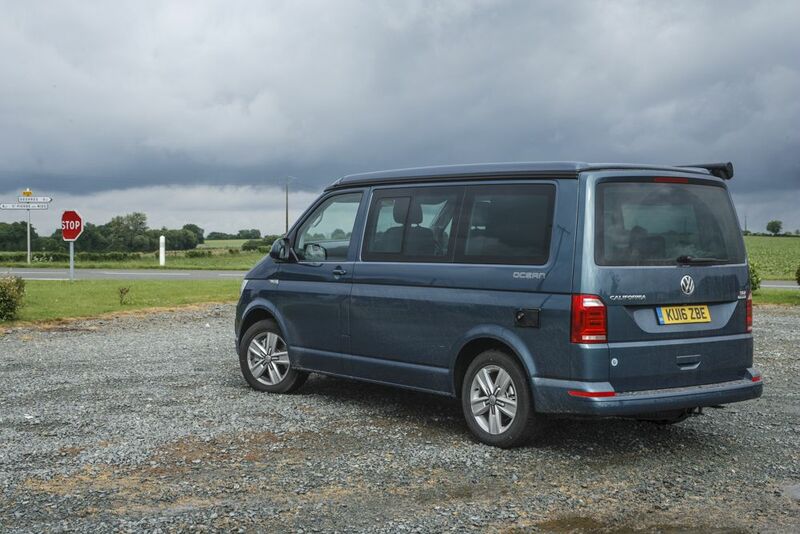 Our vehicle was fitted with VW’s 4-cylinder BiTDI engine developing 204 PS, which offered effortless motoring with bucket-loads of power on tap. On my Le Mans adventure, the California returned an average of between 41-42 mpg, which when you consider that you are driving around in your home from home, is quite impressive. 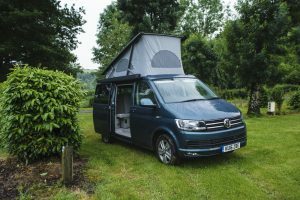 There is though the argument that with a camper van, if you want to explore the region you are visiting on your holiday, you have to do it in the vehicle that you also sleep and cook in. 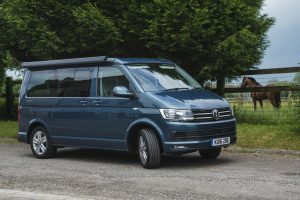 The other alternative is a caravan, which of course you can unhitch and leave at your campsite while you explore the area in your family car. But life is about so many compromises, and one has to decide which is the best option for you. 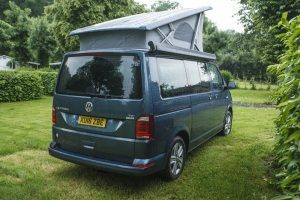 For me, it would be a California with a bike rack on the back, giving you the freedom of exploring your holiday area on a bike, while the California stays back at the campsite. So the next time you see a California on the road, you can imagine how you might enjoy your next holiday! Transmission: Six speed manual, front wheel drive. Power: 204 PS @ 4000rpm. Fuel consumption: Urban: 34.9 mpg; Extra-urban: 47.1 mpg; Combined: 41.5mpg (Actual consumption achieved on test, 41–42 mpg). 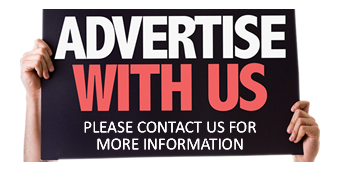 You may also be interested in the other articles in our ‘Motoring for Fun’ series; please click HERE to view.